Sign Up Below And Get Your Free Digital Book - "Herb and Spice Mixes of The World"
Sign up for my monthly newsletter below and get your FREE copy of "Spice Blends From Around The World" ebook. 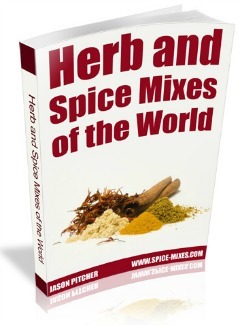 The 11 spice blend recipes from India to Africa to China etc, are in a convenient ebook just for you. These healthy spice mix recipes do not contain any preservatives, colours or additives. Once you've confirmed your newsletter subscription, you'll be able to download your copy and start making fabulous homemade spice mixes and herb blends. And remember, you can unsubscribe at any time. The "Flavour At Your Fingertips" FREE Newsletter is a great way for me to keep in touch and keep you updated with changes and additions to the Bespoke Spices website. Each month I'll share fresh content and great stuff only for subscribers. If you have friends or family who love delicious cooking as much as we do, why not email them copy of the e-book. Better yet, get them to sign up to the newsletter! Not ready to sign up to the herbs, spices and their uses newsletter yet?